Airline movies, for the most part, aren’t very good. It’s better to rent a movie, download a podcast or even listen to music on your portable device. The problem I have found is that after about twenty minutes of holding your device, your arm gets tired. Also, try to fall asleep with the iPod on your lap. Maybe you will get lucky and it won’t roll off your leg under the wheels on the darn drink cart. The flight attendants drive those things like Indy Racers down the aisle. Your tablet or phone is no match for a crazed flight attendant behind one of those carts. Fortunately there are solutions built and ready to go that makes your time on a long flight a lot more enjoyable. Always think about ensuring that what you purchase can make it through security and is small enough to fit in your luggage. Ever see those mounts that clip on a windshield visor? The snack take is pretty much the same width as a visor. Buy a visor mount and just clip it to the seat in front of you. Ever taste airline food? You aren’t going to want to eat that slop! 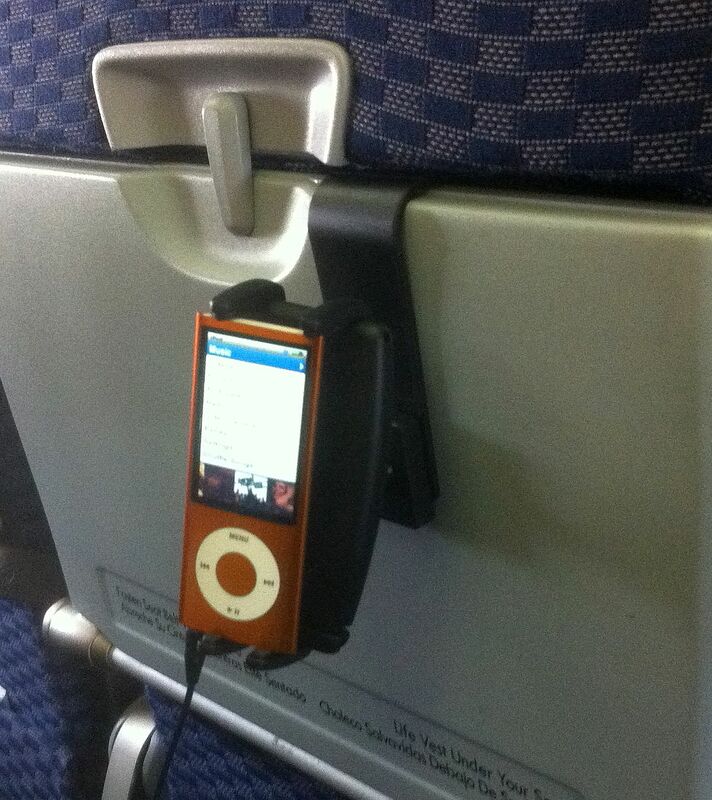 Might as well use the tray table for something useful, like mounting your MP3 player, smartphone, iPhone, whatever! Speaking of those snack tables, could they possibly make them any smaller or inconvenient? That little round indent for the cup, why bother? The photo along with this article is the Arkon Sun Visor Phone Mount. These have an expandable cradle that opens to almost six inches and that’s large enough to hold almost any phone out there including those in a case or skin. The holder comes with two sets of support legs. Most phones will use the longer legs to give you up to six inches of height. As long as we’re talking about the snack tables, take a look at some of the foldable stands that are available that you can fit in your back pocket. As long as the snack table is unfolded, lay out the stand and place your tablet on it. No hands required and you can easily watch the movie on your tablet. An excellent stand that doubles as a ring grip is the iRing Universal Stand and Holder for Smartphones. We wrote a very extensive article on this accessory which can be read here. Want to put your tablet on your lap? You can do that too. We have seen a few solutions from RAM and a few other manufacturers that permit you to strap the tablet to your leg. I can’t speak to the comfort factor, but if you are worried about it slipping off and falling victim to the drink cart, these mounts will maintain a tight grip on your tablet. Please remember to remove the mount if you get up to hit the rest room or passengers may get a pretty good laugh at your expense. Lastly, consider using a suction cup mount if you have a window seat. A solid windshield mount with a gooseneck or adjustable arm will place the tablet or phone right in front of you. If you need to get out, simply bend it out of the way. Be sure to get a mount with a vacuum base for optimal adherence and make sure the suction cup is at least 3 inches across for good performance. I suggest a higher end mount such as the Arkon Windshield Mount for Smartphones that is rigid and not prone to the vibrations of a plane ride. Sometimes it’s difficult enough to keep down your lunch, but having to experience The Matrix in a vibrating airplane might be enough to lose it.